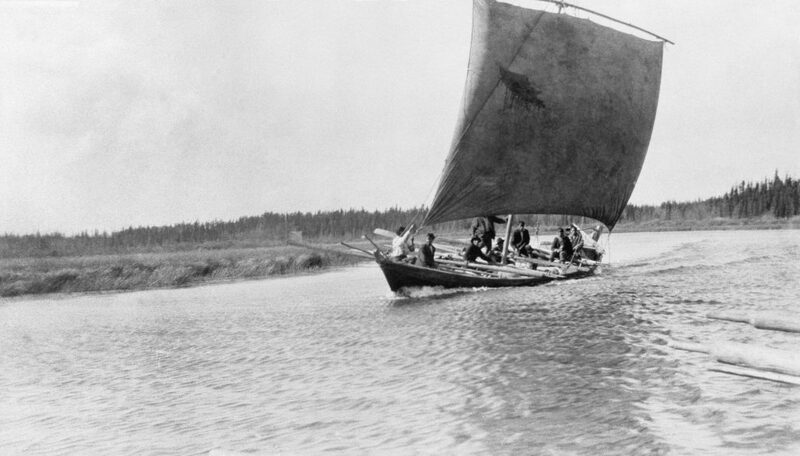 This powerful image of a York Boat under sail is Image na-1847-5 at Glenbow Archives, and is used with their permission. 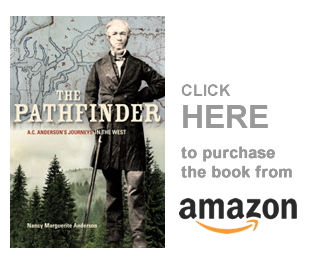 In the process of writing Alexander Caulfield Anderson’s life story, I uncovered a host of stories about other men who lived and worked in this territory west of the Rocky Mountains. One of these stories was that of the York Factory Express. In this book I tell the story of the York Factory Express, and of the Saskatchewan brigades they joined at Edmonton House. The stories are told in the words of the gentlemen, the educated, usually Scottish traders and clerks who wrote the journals. However, the men who made the Express journey possible are the invisible, unnamed French Canadians (the “Canadiens”) and their Métis descendants who powered the boats across the continent every year between 1826 and 1854. The gentlemen were the passengers. The Canadiens, Orkneymen, and Iroquois, and their Métis children and grandchildren, did all the heavy work and were almost entirely responsible for the success of the 5,400-mile journey. But their history was oral. If the gentlemen had not preserved the stories the voyageurs told them, we would not know this history today. Those invisible, unnamed men who were chosen for the Express were strong young men whose overabundance of testosterone was the engine that powered the boats. They left Fort Vancouver [Vancouver, WA] in time to cross the Athabasca Pass in early spring, while the snow underfoot was solid and the weather generally good. Once at Edmonton House the fast-travelling, lightly-laden Express party joined the Saskatchewan District’s slow-moving brigades that lumbered down the North Saskatchewan River on their way to Norway House and Hudson Bay. They reached York Factory, on Hudson Bay, in late June, and left again in early July. In September they were back at Edmonton House. In October they crossed the mountains again, and by November had returned Fort Vancouver. Their 5,400 mile journey took them seven-months, and it played a part in the life of every man who worked west of the Rocky Mountains. For twenty-eight consecutive years, the men left Fort Vancouver in March, and returned in November. This was a huge accomplishment, and was largely due to the character of the Canadien and Iroquois men who rowed the boats in the early years, and the Métis and First Nations men who later replaced them. These young men were proud of their vocation. Before they arrived at each post they paused to wash their faces and don fresh shirts and ribbons so they could paddle around the final corner in the river as energetically as if they had just started the voyage. Like all young men, they partied hard, and they drank their regales of rum, given to them by the gentlemen, with gusto. They scorned sleep and paddled long hours every day when the going was good and the river safe. They took many risks, knowing they might not survive them, but they also listened to the advice of their elders. They teased each other out of bad moods, and made jokes of the unbelievable difficulties they endured. In this way, they accomplished the impossible, and they were always careful to make the impossible appear to be only a few days’ casual journey. This was their life, and they were happy in it. They were young men, and flaunting their manliness was a part of the voyageur culture, just as their ability to hunt for food was a part of their manliness. Like their ancestors, who had left France two centuries earlier and made their homes in the wilderness of Quebec, these men chose to live in a new wilderness. They spurned the gentlemen’s idea of civilization. They loved their freedoms and believed that they were free. Many times, the Canadian and Métis men who arrived on the west side of the Rocky Mountains never returned home, but married and died in the west. Their many descendants are still here. “The York Factory Express” will be published by Ronsdale Press in April 2019.